We celebrated my son's 5th birthday on Friday, and so he and I decided we needed to take some cupcakes to school to let his friends in on the celebrations. We made these delicious vegan cupcakes from A Beautiful Mess, and added a delicious chocolate glaze on top instead of icing. What's nice about the glaze is that it is a more subtle hint of sweet rather than the over-powering sweetness that traditional icing can sometimes have. 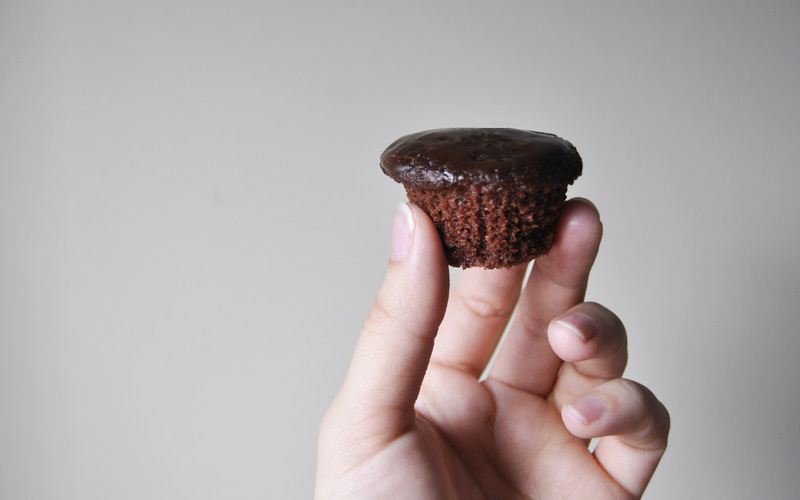 We also made them mini because bite-size is nice for smaller people -- they are less likely to waste them, too. We cut the cooking time roughly in half and let them bake for 10-13 minutes. Stir the cocoa, water, syrup and margarine in a sauce pan until smooth, melted and heated. Remove from heat and beat in vanilla and icing sugar. More water or icing sugar might have to be added depending on desired thickness. Drizzle over a cake or spread on cupcakes.